In Utah, the nonpoint source pollution program is administered jointly by the Utah Division of Water Quality. the program succeeds through the combined efforts of Utah's citizens, and many private, state and federal partners. First, the "beneficial uses" that each water body in the state can provide our citizens is determined. In Utah, we have several categories of beneficial uses: agricultural uses, wildlife uses, recreational uses and water used as a source of drinking water. 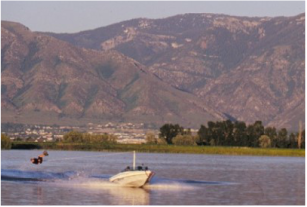 We also have a special category in Utah for the Great Salt Lake, since it is a unique waterbody. You can see these categories at UAC 317-2-6 OR find a specific water body on the interactive map. The quality of water necessary to protect these uses can vary considerably. The UDWQ has established standards (water quality criteria and "narrative standards") that help identify whether specific water bodies are meeting their designated beneficial uses. These standards are described in UAC 317-2-7. The Division of Water Quality leads the effort in regularly assessing all our water bodies to determine if they are, in fact, meeting their designated beneficial uses. They use a combination of techniques, including measuring water chemistry and evaluating the health of the community of organisms living in the water. If a water body is found to be "impaired" because of a specific pollutant, a special planning process is initiated. This process includes local leaders, landowners and other interested citizens to assure that the process is inclusive and fair. The product of this process is typically a watershed-based plan that identifies the different sources of the pollutant and suggests best management practices to reduce those sources.